■ To increase/reduce: turn control 1 or 6 clockwise or counter-clockwise . Only change the temperature setting in small increments. Start at 72 ‡ (22 †). ■ To increase/reduce the temperature in the front: turn control 1 or 6 clockwise or counter-clockwise . 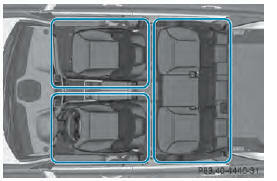 ■ To increase/reduce the temperature in the rear compartment using the front control panel: press the button. ■ Turn control : clockwise or counterclockwise . ■ To increase/decrease the rear compartment temperature using the rear control panel: turn control 17 clockwise or counter-clockwise on the rear control panel .